Commissioned by Friedman Benda, on the passing of the great furniture artist. We have lost a giant in the world of design. Inexhaustibly creative to the last, Wendell Castle was in the midst of preparing a new body of work when he passed away this week, at the age of eighty-five. It was typical of him. Wendell was a man who never stopped dreaming, or making those dreams a reality. Wendell was born in Emporia, Kansas, in 1932. In his growing-up years he struggled with dyslexia. “I was not good at anything,” he said in 2016. The only exceptions were “drawing and daydreaming, neither of which were valued.” At the time, it was incredibly painful for him, but in later years he was remarkably open about the experience, offering it to younger artists who might be suffering their own setbacks and self-doubts. His message was always: a new reality is there, just waiting to be imagined, and don’t let anyone tell you otherwise. Through sheer creative drive, which would stay with him lifelong, Wendell prevailed over his early obstacles and entered an industrial design program at the University of Kansas. He came to his career, however, through a door marked “sculpture,” receiving a Master of Fine Arts in that discipline in 1961. He remembered an influential exchange with one of his professors. Wendell had decided to build himself a toolbox rather than spending money on one. His instructor demanded to know why he was wasting time making a functional object instead of an art work. Castle said to himself, why not do both at once? Just like that, he was off. A decade before the concept of “radical design” emerged, he began reimagining the furniture form at every level. His earliest works were at once sinuous and sculptural, all choreographed curves, not a straight line or right angle to be seen. They were made using traditional joinery, but with highly unconventional cage-like structures and muscular curved components, which he carved from gunstocks, having found a supply of unused blanks at a nearby armament factory. At this initial stage of his career he also created a lyrical music stand, a calligraphic drawing in space; it is widely acknowledged as one of the great works of 20th century design. On the strength of these beautiful and innovative objects he was appointed an instructor in the furniture department at the School for American Craftsmen, Rochester Institute of Technology. Although he left his position there in 1971, he would later return as an Artist in Residence, and remained in Rochester the rest of his life. He barely paused over his early achievements, instead plunging into a new process called “stack lamination.” Remembering a Delta Tools pamphlet he had as a kid, which told how to carve a duck decoy from a set of pre-sawn glued blocks, he realized he could do the same at large scale. This technique freed him to pursue his imagination wherever it led. He made massive biomorphic tables, capacious seating forms, twisting spiral staircases, uncategorizable pieces that engaged the walls and floor of a room in unconventional ways. 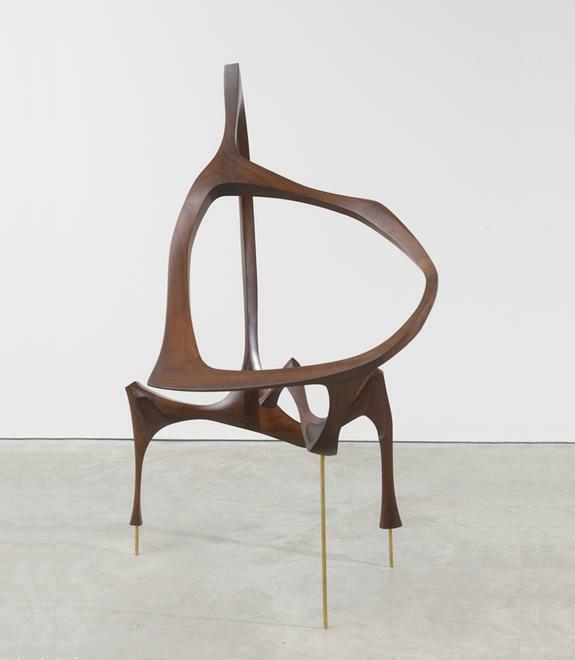 While he was operating in the discipline of furniture, he retained the instincts and formal references of sculpture – the work was more indebted to Henry Moore than anything else that was happening then or indeed, had ever happened before in furniture design. Wendell soon had imitators and admirers all over, and began to be included in key exhibitions at home and abroad, including the 1964 Milan Triennale and the seminal touring show Objects USA (1969). On one visit to Italy he saw his first molded plastic furniture, and resolved to experiment with the medium. This was a logical step, as injection molding allowed for the same freeform approach that stack lamination did, with the added possibility for mass production. His innovative contributions in this direction – including the much-admired Molar chairs (1969) – were the first significant plastic furniture made in America. Ever restless, Wendell moved on yet again, and again. An interest in trompe l’oeil led to a series of uncanny still life-based objects, culminating with the Ghost Clock (1985), a beloved icon in the collection of the Renwick Gallery, Smithsonian American Art Museum. Even less predictably, he began to explore the historic furniture styles from which he had always radically departed. His reinventions of Art Deco and Neoclassicism reflected contemporaneous postmodern interests in the past, while also giving him opportunities to explore narrative themes. A particularly powerful series from this period was based on the 1920 silent film The Cabinet of Dr. Caligari. Executed in a palette of white, black and gray, it is the apex of painterly expressionism in furniture history; a folding screen from the group is in the collection of the Metropolitan Museum of Art. Friedman Benda began working with Wendell in 2006. Though the artist was ten years past legal retirement age at the time, he plunged into the collaboration with unstoppable energy. He became interested in reinterpreting his early stack laminated forms for the twenty-first century. In doing so, through the highly innovative use of digital technology, he achieved yet another transformative milestone for the discipline. Freed by the possibilities of robotic carving, he could create work at larger scale than ever before, flip and cut forms, and execute complex multipart compositions. Wendell pursued this work with his customary combination of relentless intensity and playful wit. He also branched into materials other than wood, returning to plastics and casting some of his most successful designs in bronze. Among the high points of this late-career campaign was the multipart A New Environment, shown at Friedman Benda in 2013, which synthesized references from the course of his career into a single work of dynamic installation art. The inventive use of technology was the topic of a major exhibition entitled Wendell Castle Remastered, curated by Ron Labaco for the Museum of Arts and Design; it has subsequently been on view at the Memorial Art Gallery in Rochester. The artist’s last exhibition at Friedman Benda, Embracing Upheaval, was held in 2017; it included major works in wood and bronze, among them a series of seating forms supported on thickly dimensioned, curving elements reminiscent of natural tree trunks. It was a typical Wendell Castle project, wildly ambitious but with consummate sculptural intelligence. Surrounded by these monuments, which proved to be his last, you could feel the quiet joy he had taken in shaping them as models in his hands, and his satisfaction as he saw them realized at full scale over a period of weeks and months. Wendell is remembered for so many things: his extraordinary output, so impressive in range and quality, first and foremost. But there is also the way he supported younger makers in his shop, which served as a talent factory for the field over the years. He was also a hugely important ambassador for American craft and design. Soft-spoken and always true to his modest Midwestern roots, he cut a dashing figure. Always stylish in his candy-colored spectacles, well-tailored jackets and spotless shoes, his quietly confident presence lifted the tone of any gathering. He was devoted to his wife, the ceramic artist Nancy Jurs, and his daughter Alison, who is currently at work on a documentary film about Wendell’s life and work, as well as Bryon Jurs, who worked in his adoptive father’s shop for many years. He also leaves behind two grandchildren, Archie and Arabella, as well as former apprentices and the extraordinarily committed team at the studio. In a sense, too, the whole world of design was Wendell’s extended family. So many will mourn the loss of this incredible man, who brought so much into the world, and has left such extraordinary objects behind. Wendell was fond of collected folk wisdom, part of his Midwestern inheritance. In 1996 he published what he called his “ten adopted rules of thumb.” Among them: the dog who stays on the porch will find no bones. And: if you hit the bullseye every time, the target is too near. Wendell was no porch-sitter, that is for sure. And for a man who hit an awful lot of bullseyes, he remained extraordinarily modest about his accomplishments, ever on the lookout for the further target. Now he is gone. No one will be able to fill his elegant shoes, but there is one more thing we can learn from him. He never, ever looked back. Even at this moment of loss, we will do him greatest justice by asking: what’s next?